Soften Your Skin with Suave + Enter to Win! 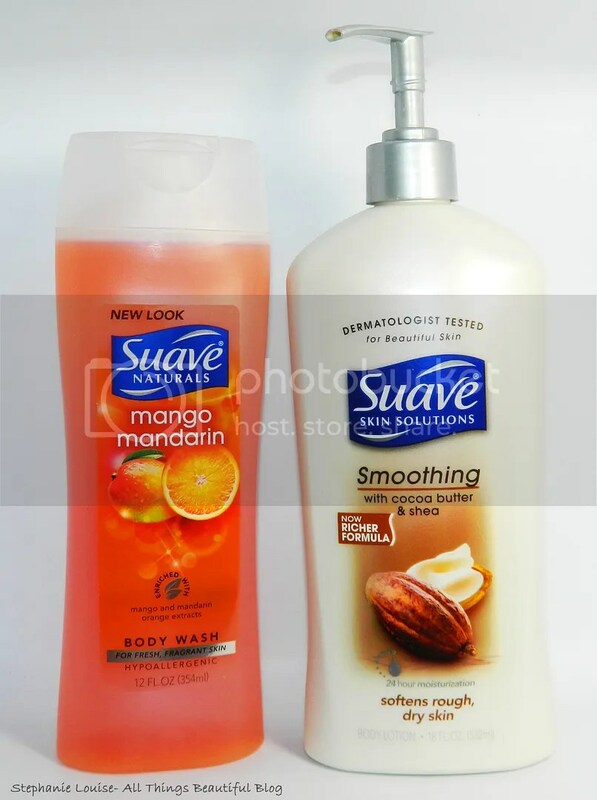 I absolutely love Suave® products. You’ve seen them here before & you’ll be seeing a lot coming up as well! Seriously…they have transformed my hair! Anyway, back on the topic of softening up dry skin! Today I’m sharing two products foolproof for summer skin! I’ve been using Suave Naturals Mango Mandarin Body Wash & Suave Skin Solutions Smoothing Body Lotion with Cocoa Butter & Shea for the perfect one-two punch! Everyday life can be rough, but Suave® Body Care is helping women everywhere realize that it doesn’t mean they have to be. The brand is teaming up with TV host, author and mom Wendy Williams to encourage everyone to Unlock their Softer Side, from their skincare routines to their mindsets. Starting out with the Suave Natural Body Wash in Mango Mandarin, I’m in love! This definitely beats out other orange based body washes I’ve tried because it doesn’t smell fake at all. Instead, it smells like peeling a fresh orange. All zesty & crisp…yum! Then you get a touch of mango on the end. The combo is wonderfully crisp & energizing. This body wash is enriched with mango & mandarin extracts plus Vitamin E, so it cleans skin without stripping it. I prefer to use this with a pouf in the shower! If this scent isn’t up your alley, then you might like some of my other favorites like Rainforest Fresh, Milk & Honey Splash, & of course, Everlasting Sunshine. You can see my rave about the Suave deodorant in Everlasting Sunshine here with a completely unique scent! To moisturize my dry skin I’ve been turning to Suave Skin Solutions Smoothing Body Lotion with Cocoa Butter & Shea. I love these types of scents, a bit warm & tropical smelling but not overpowering. I prefer these types of scents in the summer especially because I can layer it with other scents I tend to lean towards for summer. I find perfumes & body sprays with tropical type bases (such as coconut, mango, & lime) blend really nicely! The reason I prefer this body lotion (besides the scent obviously!) is because it is nourishing without being greasy at all. I find I can layer it onto drier areas throughout the day if needed & it leaves my skin soft & smooth. Basically, Suave has my body care covered. I love that I can find the products locally from multiple retailers as well, so I don’t feel bad about stocking up! Suave fans can find out their softness score, check out Wendy’s tips, & have the chance to win a free product at here. Enter for the chance win a $100 SpaFinder gift card! Tell me what Suave product you would use to Unlock Your Softer Side in the comments section below. Don’t forget to Unlock Your Softer Side, and visit Suave on Facebook!